Upon the discovery of crude oil in commercial quantities in 2007, Ghana was blessed with natural gas. The intention to monetize natural gas came as an after-thought because, Government had violated it “zero-flaring” stance when oil production commenced at the Jubilee Field. In spite of the harmful health and environmental consequences, natural gas was flared. Flared gas could have powered thermal plants for power generation to curtail “dumsor’’. For instance, according a report by tv3network as cited by Ghanweb, Tullow Ghana flared an average of 75 million standard cubic feet (mmscf) of gas during the breakdown of the FPSO Kwame Nkrumah in 2015 and raised questions regarding the prospects of a natural gas industry. In recognition of the potential of Ghana’s oil and gas resources to national development, former late President, Professor John Evans Atta Mills in February 2011 commissioned a “National Gas Development Task Force” to review and make appropriate recommendations for the speedy realization of a national gas commercialization infrastructure system. By acting on the report submitted to the late President, he authorized the establishment of the Ghana National Gas Company (Ghana Gas Company). Ghana National Gas Company was incorporated as a limited liability company in July 2011 with the responsibility to build, own and operate infrastructure required for the gathering, processing, transporting and marketing of natural gas resources in the country. It assets include the Offshore Pipeline, the Onshore Pipeline, the Gas Processing Plant, the Natural Gas Liquids Tank Farm and Transfer Line, Calm Buoy and the Office Complex all at Atuabo. 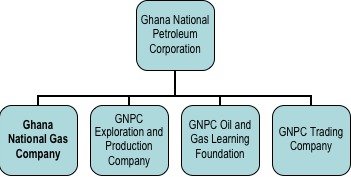 Ghana Gas Company together with Ghana National Petroleum Corporation (GNPC) Exploration and Production Company (Explorco), GNPC Oil and Gas Learning Foundation and GNPC Trading Company are subsidiaries of Ghana National Petroleum Corporation. (See figure below). Ghana Gas Company has built, owns and operates a plant required for the gathering, processing, transporting and marketing of natural gas resources in the country with GNPC established by PNDC Law 64, to support the government’s objective of providing adequate and reliable supply of petroleum products and reducing the country’s dependence on crude oil imports, through the development of the country’s own petroleum resources. GNPC also is a buyer and marketer of gas at the oil field and the owner of natural gas until it is sold. The Bulk Oil Storage and Transportation Company (BOST) was issued with a Natural Gas Transmission Utility License by the Ghana Energy Commission (EC) Act 541, on December 19th, 2012, to transport and interconnect services for natural gas in Ghana and to operators of natural gas networks within the ECOWAS sub region. Who is in charge of natural gas transport? Ghana Gas Company? BOST? or both? 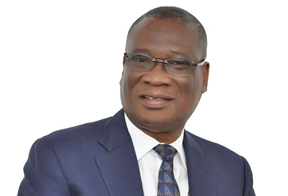 Who should do the selling of natural gas to GNPC or Ghana Gas Company? Who should enter into Gas purchase agreements GNPC or Ghana Gas Company? There are copious institutions with unclear limits for the natural gas sector. Recall, that GNPC is involved in a Joint Venture (JV) with ENI and Vitol in constructing an onshore gas collection plant (similar to the natural gas facility at Atuabo). The project foresees the production of an estimated 180 mmscf of gas per day. Is this a good business move? or it follows the age-old business investment tip “do not put all eggs in one basket”? Why didn’t GNPC invest in Ghana Gas Company to expand it and make it a large multinational? Even though this may be good for gas security, does it follow the parlance, which states, “A man’s enemy are members of his household”? Since GNPC always leads in the signing of gas purchase agreements, why is it that, Ghana Gas Company isn’t autonomous? Why is Ghana Gas Company not invited to the negotiation table? Why does GNPC negotiate and dump negotiated deals on Ghana Gas Company who would have to sell lean gas at an uncompetitive price to power companies? Why did Ghana Gas Company sign a Project Implementation Agreement (PIA) with SINOPEC International but not granted sector autonomy? Why is it that Ghana Gas Company is a subsidiary of GNPC?With the advent of Ghana Gas Company, can the natural gas mandate of BOST be ceded to Ghana Gas Company to make a top-class institution ?Can GNPC cede marketing and transport duty of natural gas to Ghana Gas Company and be resourced to provide efficient operations in a sustainable manner?